Not for a minute do I believe that Italians hold the copyright to good sense in the kitchen. I should have started by saying that the Italians in these ramblings are like a placeholder for all those authentic culinary traditions that derive from what grows well in local soil and is raised on local pastures. Factors as pivotal in Kerala as they are Kiev, in Bogota as they are Bergamo, that is; I don’t think the Italians are better than the rest, just that this particularly fertile peninsula has a vast collection of wonderful traditions, and that I happen to live here. So much of what Italians cook all over the boot comes from the heritage of the cucina povera where inventiveness makes even the simplest soup sing and where foraged greens turn into something special because they have been tossed through the pan with chili and garlic. So this post is all about the soffritto – the base, the beginning, the essential starting point to so many great dishes from the cucina povera tradition; soups, minestre, sughi e ragù, slow cooked meats, stews, risotti. Soffritto – which means to fry at a low temperature – is that gentle softening, or sweating of the trio of vegetables; onion (normally brown or white), carrot and celery in olive oil, or perhaps a knob of butter, and in some cases even a mix of the two. Making many of the aforementioned dishes without the soffritto would be like building a house without foundations, like turning on the gas under the moka on without coffee grinds in it. Long treatises have been written about getting the soffritto right; about cutting the vegetables into fine enough pieces to thus increasing the surface area and thereby the flavour that is sucked out of them as they sweat gently in the oil. The same for the temperature at which they are cooked; always over a low flame that treats them gently, and the importance of a solid heavy based pan. I also like to cook soups and simple stews in a terracotta cooking pot. Depending on what you are cooking there are other things that go in at the soffritto stage, for example a clove of garlic, left whole but having been peeled and deftly squashed with the flat side of a knife, to let the garlic essence out without being over-powering and running the risk of burning. A pinch of salt helps and lovers of cured pork products like a handful of guanciale or pancetta, or offcuts from a prosciutto tossed in with the soffritto when buidling up the flavours for a hearty meat ragù or a wintery minestrone, a bit like the ham hock in a pean and ham soup. Then there is the rosemary. Until I came to Italy I think I only used rosemary for lamb and potatoes, now I have a whole new appreciation for the fragrant notes it lends to soups and stews. 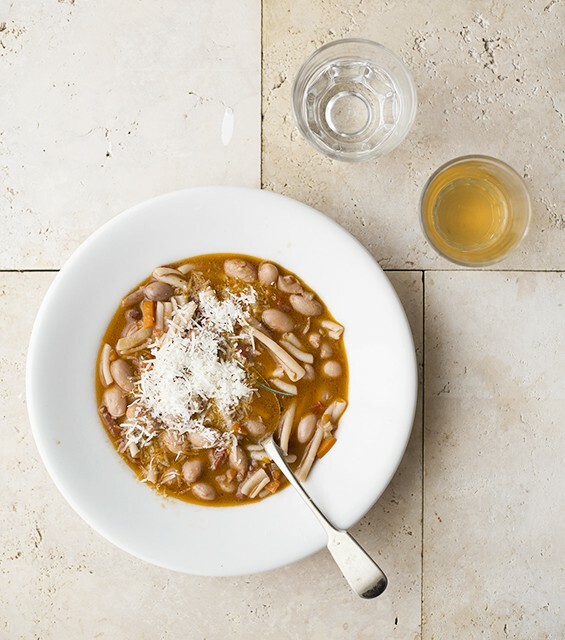 I’ve written about Pasta e Fagioli before, that is, the way Leonardo makes it, and how the heady perfume of the rosemary stands out against the heartiness of the beans and the gluttonous notes of the pancetta. I’m repeating the recipe here because it belongs in my ten years in Italy collection for many reasons. 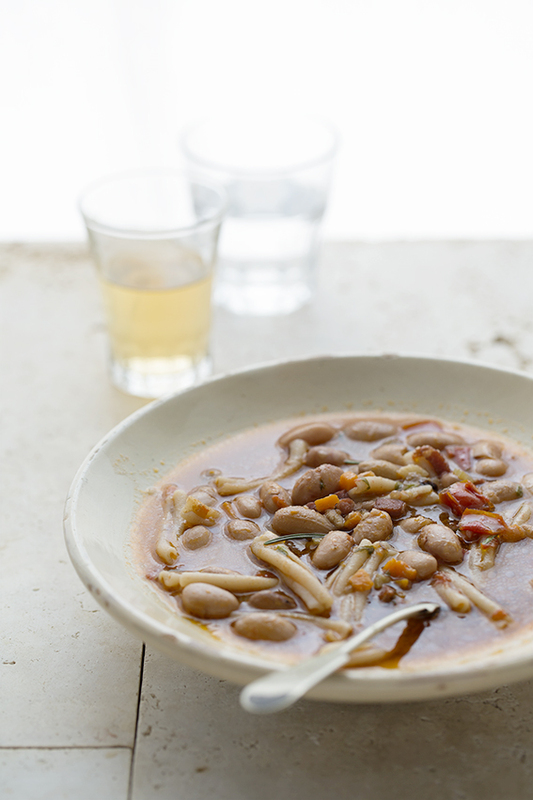 The Italians, there they are again, have taught me to value and love legumes, and Pasta e Fagioli is one of those dishes that really is eaten up and down the country, with the recipe changing of course from town to town, family to family. It is a cornerstone of the country’s gastronomic tradition(s) sadly overshadowed by the myth that Italians only eat pasta and pizza. 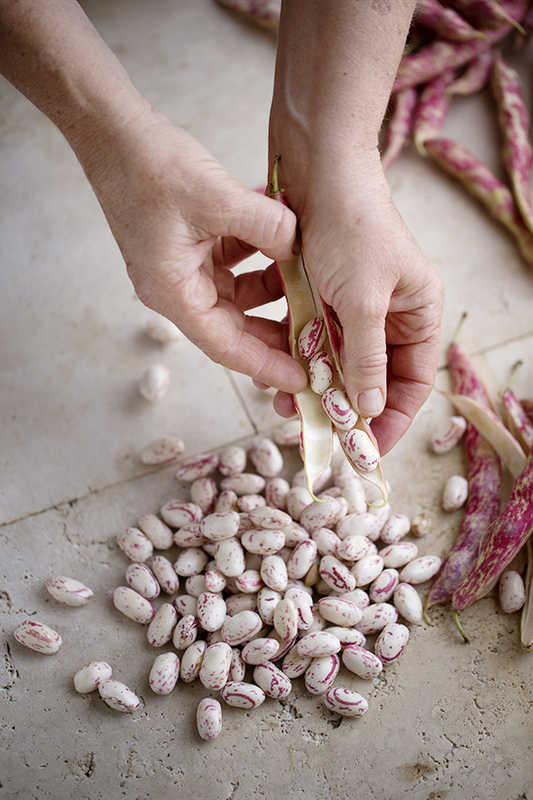 When fresh beans are available- in this case borlotti that look like they have been hand printed by a Florentine paper artisan – the soup is all the better. Autumn is so lovable for that special window when the last of the summer beans are still at the market but the temperature has dropped to soup season levels. 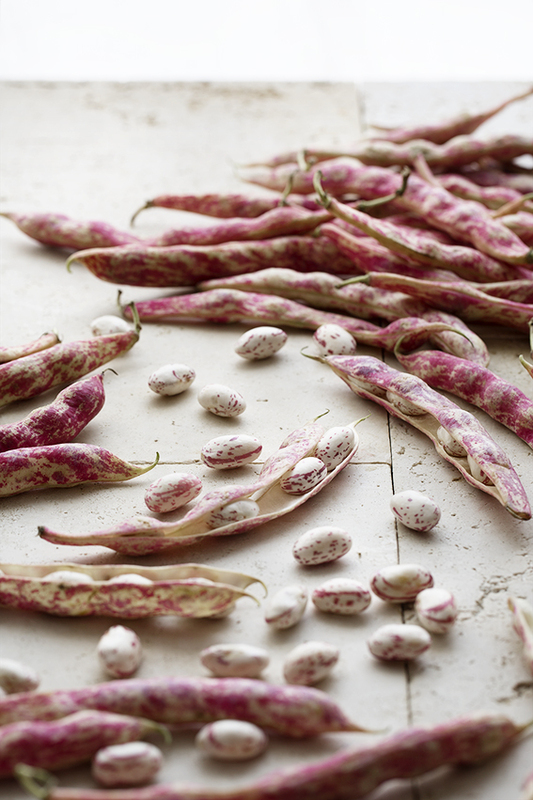 Soak the borlotti beans overnight. Rinse and cook covered in plenty of water for an hour, adding a pinch of salt half way through the cooking process. They should be cooked al dente – they will continue to cook as the soup is assembled. If cooking with fresh beans cover them with cold water, toss in a bay leaf or two, and simmer for 20-25 minutes, again they’ll continue to cook in the soup. While the beans are cooking make a simple vegetable stock by simmering 1500 ml of water with a carrot, black peppercorns, a stalk of celery with leaves and half and onion. Very finely chop the vegetables. 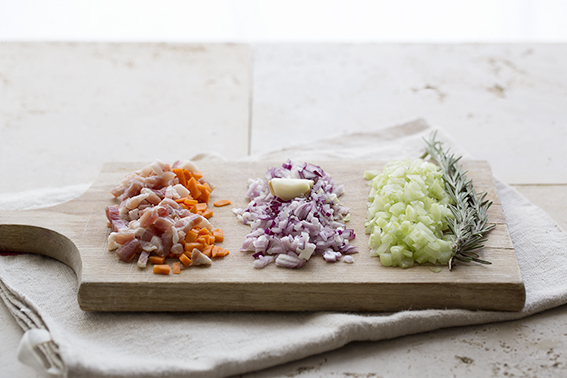 In a terra-cotta cooking pot or a good heavy based pan gently fry the pancetta in one tablespoon of olive oil, then add another tablespoon of oil and the chopped onion, carrot and celery, reduce the heat and gently sauté until the vegetables are translucent. At this point add the tomato passata and stir well, and then add a litre of vegetable stock and the cooked beans (keep the beans’ cooking water) and cook over a medium flame for about half an hour. Some people puree all of the soup but I like to remove just one third of the soup, blend it quickly with a hand held blender before returning it to the pot. Bring the soup up to the boil and add the pasta, which can be any kind but broken lasagna al’uovo or tagliatelle work nicely, while dittalini (little fingers) are also popular. Make sure the soup is liquid enough to cook the pasta, add extra bean water or vegetable stock if you need to lengthen it. When the pasta is al dente everything should be given a good 5-10 minute rest before serving. Serve with a drizzle of extra virgin olive oil. Una grattatina di formaggio – parmigiano or pecorino – works nicely too.